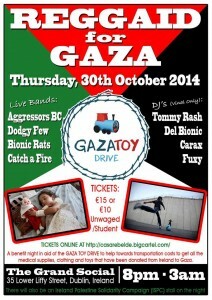 Benefit night in aid of GAZA TOY DRIVE to help towards the transportation costs to get all the medical supplies,clothing and toys that have been donated all over Ireland to Gaza. Catch A Fire (Orginal Line up) Playing the music of Bob Marley and the Wailers. There will also be a Ireland Palestine Solidarity Campaign stall.